Building strength and power is key to healthy aging, both physically and mentally. It may be easier than you think. We probably don't need to remind you that your body changes with age. Age-related muscle loss begins at around age 35 and progresses slowly — at about 1% per year. 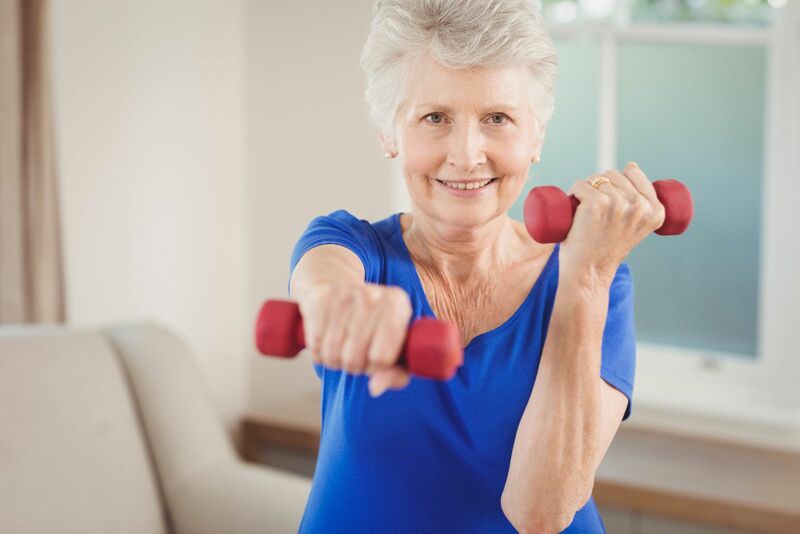 But after about age 60, muscle loses mass more rapidly, so that adults who don't do regular strength training may lose 4 to 6 pounds of muscle per decade. Moreover, the lost muscle is usually replaced by fat. Studies show that strength training not only can slow muscle loss, it can also help prevent or control conditions as varied as heart disease, diabetes, arthritis, and osteoporosis. And recent research indicates that it can also improve cognitive function, especially when added to aerobic exercise. As we age, strength training helps to preserve mobility and reduce the risk of falling. "What has been shown is that if you're looking at mobility problems, the most beneficial exercises that are those that focus on progressive training for strength and power," says Dr. Jonathan Bean, an associate professor of physical medicine and rehabilitation at Harvard Medical School. Yet only about 21% of women observe the Department of Health and Human Services' recommendation to perform activities that work all the major muscle groups at least two days a week. A 2011 study of women enrolled in a strength training program at a Minneapolis gym suggested why this may be so. About half of the participants dropped out after the first year; many of those who dropped out reported difficulty in fitting gym time into their schedules, feeling intimidated by the equipment, or being uncomfortable in a gym environment. 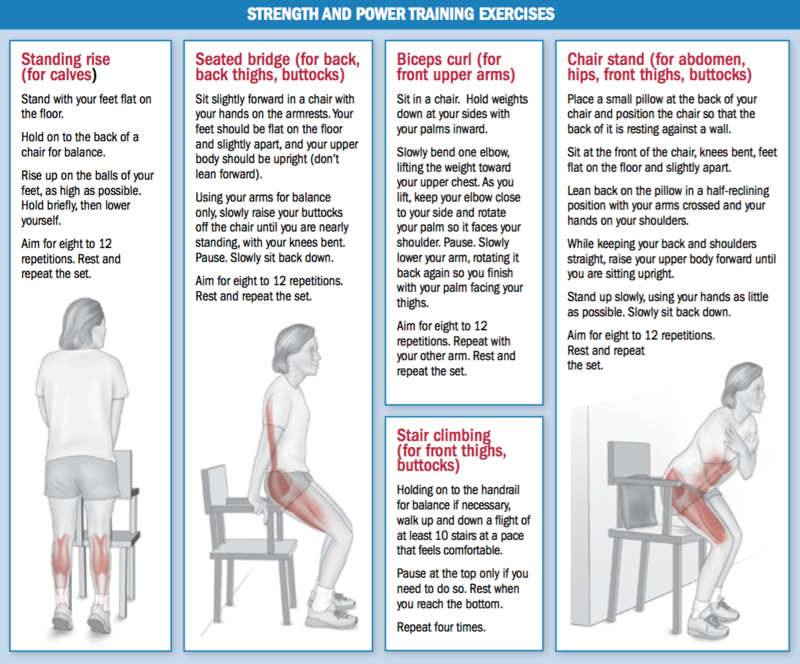 If similar concerns have kept you from launching into strength training, you may not realize that it's possible to work every muscle group in your own home with minimal equipment by doing the following exercises, which are included in the Harvard Special Health Report Strength and Power Training: A guide for older adults. Before you start, try the following: rise from a chair without using your arms, walk up and down 10 stairs without grasping the handrail, and stand on one foot without support for at least five seconds. If even one of these is difficult for you, you should have professional help and supervision as you begin. Otherwise, you can try the exercises below on your own. You can do any of them without equipment, but you will need to add dumbbells or ankle weights as you progress, and increase the weight whenever an exercise starts to feel easy. As a general rule, do the first step — lifting, rising, or climbing — in three seconds, hold for one second, and take three seconds to return to the starting position. Power training can increase the speed of your reaction while it builds strength. Building power enables you to get from one side of the street to the other before the light changes or keeps you from falling if you trip. You can add power training to the exercises below by increasing the speed at which you perform the first step of each exercise, gradually increasing speed until you're able to complete it in one second. Finally, allowing your muscles to recover is key to avoiding injury. Make sure to rest for at least a minute between sets. It's particularly important to allow 48 hours between workouts. In other words, you don't want to do strength training more than three times a week.